All study topics and their descriptions are subject to change or modification. This in-depth study of Genesis 1-11 focuses on Creation, the Fall, the Flood, the Dispersion from Babel and God’s plan throughout those periods of time. Within these chapters, there is important history and doctrine that set the foundation for the rest of the Bible. This class is an in-depth study into the text of Gen 1-3 deeper than most have ever gone. Students will even go to the original Hebrew language for clarified understanding of Genesis. From the study of these three initial chapters of Scripture, students will be flipping throughout the rest of the Bible since Genesis is the foundation for understanding the whole of Scripture. This broad overview will put the Old and New Testaments in perspective by being able to look at the whole thing in one broad sweep. This class, or study topic, traces the history of the Old Testament people including the nation of Israel through highs and lows. Cultural aspects will be explained and prophecies and references looking ahead to the Messiah will be examined. Transitioning from the Old Testament to the New Testament era, students will dive into the life of Christ, the fulfilled prophecies, cultural aspects, and the regions described in the New Testament. This whirlwind tour through the events of Jesus’ life will help open understanding of the ministry of Jesus and His apostles, what they really taught, and how we are called to live today. One of the most common objections to God, Jesus, or Christianity in general, is the fact that people do not take the Bible seriously as a legitimate source of “Truth”. In fact, the opposition to the Creation perspective tend to compromise with the authority and inerrancy of the Bible. During this class, the students will take the perspective of a cold case detective in studying the tremendous amounts of evidence that work to confirm the Truth and reliability of both the Old and New Testaments. This two week class will provide a broad overview of history showing how evolution has been a common theme long before Darwin and even before Jesus. Students will study the history of worldviews with respect to the growth and change of the history and philosophy of Evolution. This class will hit on key areas regarding Ancient thought, the rise of Christianity, the Dark Ages of Christianity, and the Enlightenment of individual Christianity that led to renewed views of life and science. Students will also study how Christianity has, itself, changed and how it has changed the world in the past few hundreds of years and ultimately since the time of Jesus. Students will also study how the idea of evolution has not only affected Christianity, but other religions, morality, and politics throughout history and especially in our culture today. This introduction is a blast of information that will simply be the top of the iceberg to concepts and classes that students will dive into throughout the year. This study topic is a broad introduction to the topic of origins and early Earth history from both science and the Bible. The class consists of a general introduction and expectations as a student at DCTI, a review of the Discover Creation DVD Series, and a broad overview of topics in the Creation vs. Evolution debate. Before hitting the road, students will explore an introductory overview of the major concepts and discoveries in the fields of earth science and geology. Students will discuss and learn about tectonics, volcanism, stratification, fossilization, erosion, and the major rock types. Concepts of uniformitarianism, catastrophism, and geologic time will also be covered. This overview will give some needed preparation before we take off on the first field trip, but classes will continue on the road as we hit the first checkpoint, Yellowstone National Park. Families and those interested in the Institute may be welcome to join in and learn as we kick off the year. Families and friends can experience the Yellowstone National Park tour before the class itself heads off towards Mt. St. Helens. During these initial class periods, students will also be able to brainstorm and pick topics for their individual ministry projects. Students will be active in assessing their strengths, weaknesses, and interests to best learn and communicate the creation message and the gospel in worthwhile ministry. This study topic serves as an overview of the history of science, the relationship between faith and reason, and the power and limitations of the scientific method. Students will learn to differentiate between science and philosophy, between facts and assumptions, and between data and interpretations. Students will learn about how assumptions and one’s worldview can and has shaped how we think about science and our world. This study topic is an introduction to the fields of anthropology and archaeology including research methods and study of selected sites and findings. Brian Mariani, one of the main researchers and authors of The Genius of Ancient Man, will share his research about cultures and sites all over the world. Students will study the origin of human kind, the distribution of various people groups, and their scientific and technological accomplishments. Many cultural aspects will be studied and which continually confirm and strengthen the records and history of the Bible. With these two weeks, students will learn about the fundamental laws and interactions of nature along with an introductory overview of the major concepts and historical discoveries of astronomy. They will explore and discuss the importance of recent discoveries about our solar system, our planet, our moon, galaxies, theories of origins, star formation and death, and related concepts. Students will discern what the evidence really is and how it shows the age of our universe. This introduction to life sciences includes discussion of the origin and diversity of life (models of origin, classification systems, overview of major groups of organisms). Students will gain an understanding of the design exhibited throughout nature and will examine the evidence for and against the theory of evolution. This continuation into the study of biology includes discussion of the complexity of life (chemistry of life, molecular biology, and genetics). Students will gain an understanding of the design exhibited throughout nature and will examine the evidence for and against the theory of evolution. This continuation of life science includes discussion of the relationships of life (ecology and environmental science). Students will gain an understanding of the design exhibited throughout nature and will examine the evidence for and against the theory of evolution. The Fossil Record is interpreted in the secular perspective as representing billions of years of Earth history, but does the evidence accurately fit that conclusion. Further fossil evidence will be investigated to show that a rapid deposition for the rock layers presents a better interpretation of the evidence. This class will be enriched and supplemented by several major field trips (listed separately). The Bible explains and records Noah’s ship log regarding the Global Flood. The Rock Layers provide plenty of evidence supporting the truth of the Flood account in the Bible. From this class, learn how a flood explains the evidence better than millions of years of slow deposition. This class will be enriched and supplemented by several major field trips (listed separately). Discover the wonders of Yellowstone National Park, the Teton Mountains, and the Pacific Northwest, focusing particularly on the geologic processes of volcanism, glaciers, stratification, and erosion. Students will see evidence for the Great Missoula Flood and the Global Flood, along with the intriguing effects of the eruption of Mt St Helens. Points of biology and historical interest will be included along the way. Discover, explore and wonder at the geologic features of the Southwest, focusing primarily on geology, but also including selected study of biology and human history. Particular emphasis will be given to studying evidences of stratification and erosion. Learn a biblical perspective for the formation of Grand Canyon, Arches, Canyonlands, Natural Bridges, Bryce Canyon, and Zion National Parks, as well as the intriguing formations at Kodachrome Basin, and many more. This study topic will study different worldviews and methods of apologetics through the themes of Origin, Identity (incorporated throughout), Meaning, Morality, and Destiny. This class introduces the concept, elements and importance of understanding your worldview as well as the worldviews of others. Students will gain valuable perspective in understanding the major worldviews encountered today and will therefore better understand these modern times. This class will be an ongoing learning experience that is integrated throughout the year. As Christians, we are called to give a defense for our faith. In this study topic, students will critically analyze and use the book I Don’t Have Enough Faith to be an Atheist to be equipped to combat common challenges and questions faced in our society today. Students will study the means of argumentation and will discuss some of the major areas of Biblical apologetics. 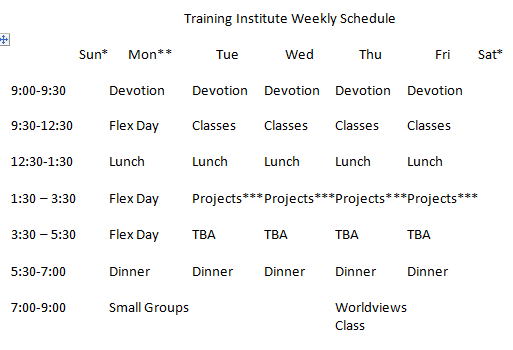 These classes are all integrated throughout the year within the normal classes, devotion times, and Bible studies. This study topic focuses on personal challenge, group dynamics, and leadership skills. Students will experience the beauty and ruggedness of the natural environment. They will be encouraged to confront fears, explore new ways of meeting challenges, and reflect on their experiences in a personal journal. This study topic focuses on developing Godly character and leadership skills. Students will study the Biblical explanations and examples of Godly leadership. The goal of this class is to develop leadership qualities that will be useful for life and family situations. This personalized class will be integrated throughout the year through evaluation of various projects. Emphasis will be placed upon the development of clear and effective communication skills, both written and oral. The class is designed to be both practical and relevant to other learning. Students will be exposed to the benefits of wise choices in personal health and wellness practices through fitness activities, study of basic nutrition, and special topics. Each student will be encouraged to develop a personal health and wellness plan, and keep a journal of progress. This class will run the entire year and will keep students accountable to their commitments. As part of this class, students will: read the entire Bible in one year, make and accomplish deadlines on projects, submit attitude and Christian behavior assessments, and more. Some of these classes are ongoing learning and experiences that are integrated throughout the year. This study topic involves the development of skills and materials for practical ministry, including multimedia presentations, skits, hands-on activities and other student driven ministry techniques. Many of these will be utilized in the Costa Rica outreach and the summer practicum. This will provide great experience for students interested in global missionary outreach. This study topic is an introduction to strategies for reaching believers and nonbelievers with the gospel and a Biblically consistent view of God, His Word, and His creation. Students will learn academic strategies for evangelism with a focus will be on tangible, worthwhile interactions and experiences. This study topic will help students learn how to engage and interact with the next generation. Students will gain an inside view as to what it takes to plan and facilitate ministry programs to children and youth. Strategies, testimonies, and experiences will provide students with another outlet for ministry. Further development from the above two classes will carry over into the courses: Preparation for Ministry Outreaches, Local Creation Ministry Outreaches, and Wrap Up: Putting it All Together. These end-of-the-year classes will provide time for students to yet again practice presenting their year-long ministry projects and hone those communication skills. After learning in the classroom and on field trips during the scheduled year, students may be able to then use their experience, their projects, and their knowledge to be actively involved in practical ministry opportunities for a part of the summer. Students may gain experience in communicating, preparing, planning and facilitating ministry activities. There may be many different opportunities to participate in creation ministry outreaches such as facilitating Vacation Bible Schools, serving as counselors and teachers at summer camps (family and/or youth camps), participating with AOI functions, and potential cross-cultural outreaches. Students not choosing to go on this trip will have this time designated to working on Creation ministry related projects. To see how the study topics fit in the year, check out the year schedule. Classes have been designed specifically for Tuesday through Friday. Monday will be devoted to work on projects, supplemental teaching, excursions and outreach ministry. This schedule is subject to change based on the needs of the instructor or class. * Some weekends will be included in field trips or special activities, but usually they will be free for rest, study, worship, and personal activities. Students provide and prepare their own meals on weekends. ** Mondays are planned as “Flex Days.” Some weeks the Flex Day may be moved to Friday. We plan to use these Flex Days for projects, excursions, study, and at times, special classes or seminars. *** Projects: Class Projects, Outreach Projects, Service Projects, etc.